A dead rat or rats is the reason why the Tax Office on the ground floor of the AP Lutali Executive Office Building has been closed the last two days. Deputy Director of Health Papalii Marion Fitisemanu said the office was closed down on Wednesday because of the overpowering stench of dead rat or rats in there. He said the smell came from the ceiling of the office and since Wednesday, a search got underway for the rodents. Administrative Office staff discovered the source of the smell, yesterday. He didn’t get a report from the inspectors whether it was one or more rats. 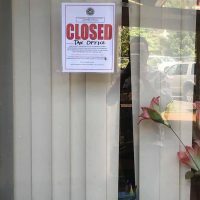 Depending on whether the smell has abated by this morning, Papalii said the Tax Office should be reopening today. The closure comes just as the 2019 tax filing season begins and wage earners are eagerly awaiting their W-2 forms from ASG. Meanwhile Director of Administrative Services Malaepule Moliga sent out a memo to all departments and agencies in the EOB reinforcing the No Food policy in the building. He said in the January 8 memo that he was reaffirming a policy initiated by the previous Director of Administrative Services on no food in the EOB due to rodent infestations which may lead to another public health issue and eventual closure of the building. He noted previous memos on this subject were issued February 13 and April 20 last year. Malaepule said that effective Monday January 8, the No Food policy shall be enforced. “EOB security officers and EOB maintenance personnel will be briefed that all will abide by this policy, no exceptions,” he said. Employees working in the EOB said they were told that food deliveries will not be allowed at all.